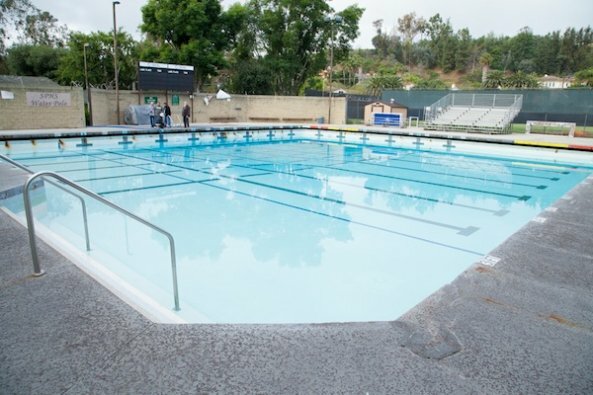 The South Pasadena High School pool is in need of plastering, tiling, and new cement, among other repairs. A neighbor picks up the hose spraying water from the South Pasadena High School pool. It was a little messy handling the hose from the pool, but this neighbor said it was worth getting wet to give his yard a drink. 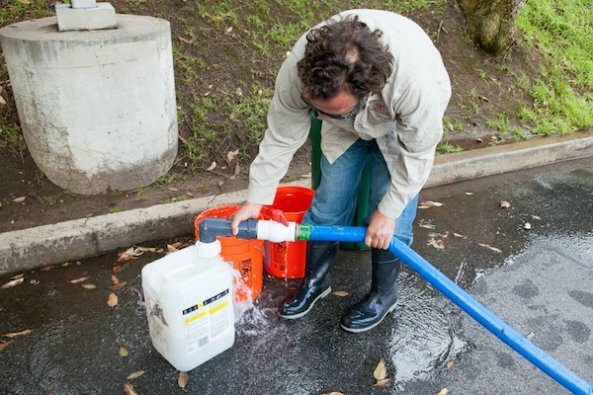 Steve, the pool manager, fills up buckets with water from the South Pasadena High School pool. 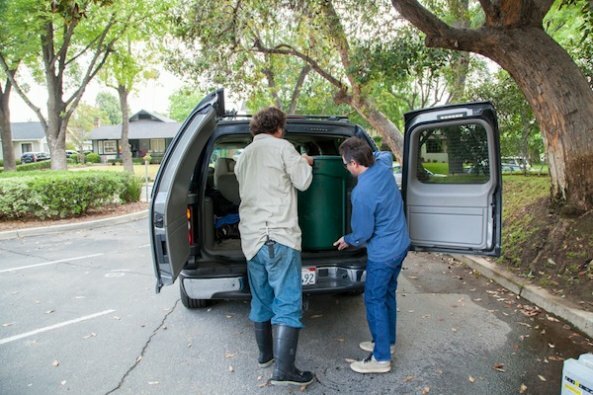 Steve helps Tom, a South Pasadena resident, load a trash can with water into Tom’s car to take home. Tom and his wife Michelle had to be careful not to spill the water they’d gotten from the South Pasadena High School pool. Michelle scoops out some South Pasadena High School pool water for her flowers. 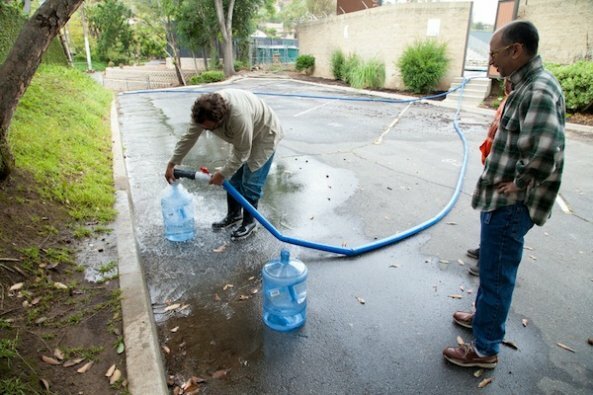 A dad and son take home some of South Pasadena High School’s pool water. 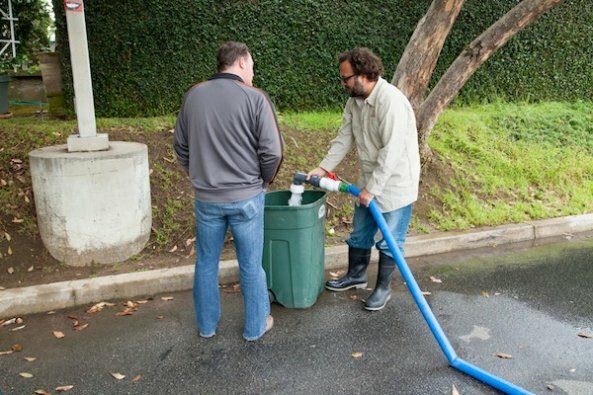 Another neighbor brings his trash can by for some of the South Pasadena High School pool water. 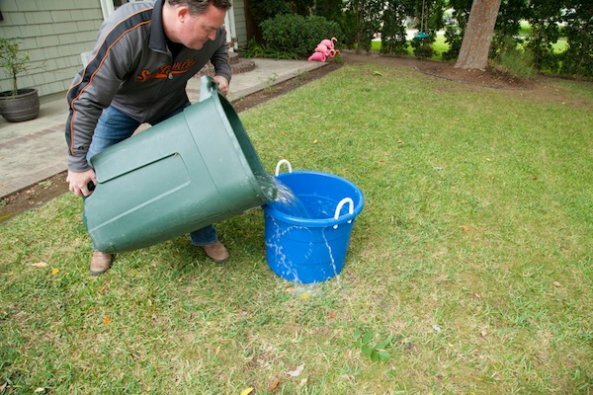 When the trash can he filled up with pool water springs a leak, this neighbor transferred it to another bucket in his yard. Sometimes you can’t even give water away, even in a time of drought. Maybe it was the rain in Southern California that week. Or maybe it was because people couldn’t be bothered to find buckets of appropriate size. Or maybe local residents just aren’t that desperate yet. 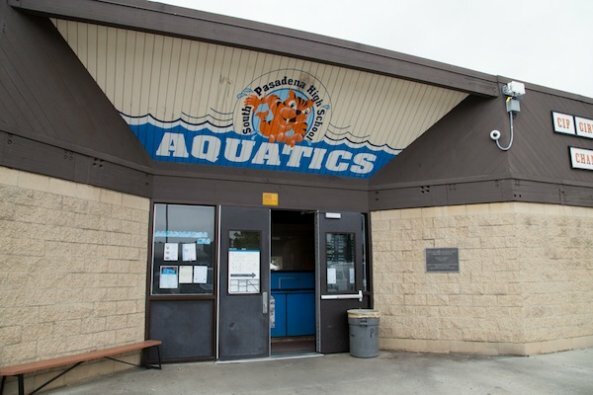 But only a handful of people showed up at South Pasadena High School this past Saturday when school district officials invited the public to carry away as much water as they wanted from the high school pool. Californians are under their first mandatory water restrictions ever as the state struggles with the fourth year of a severe dry spell and the Sierra Nevada snowpack—a major source of water for Southern California in spring and summer—is the lowest in at least 60 years. 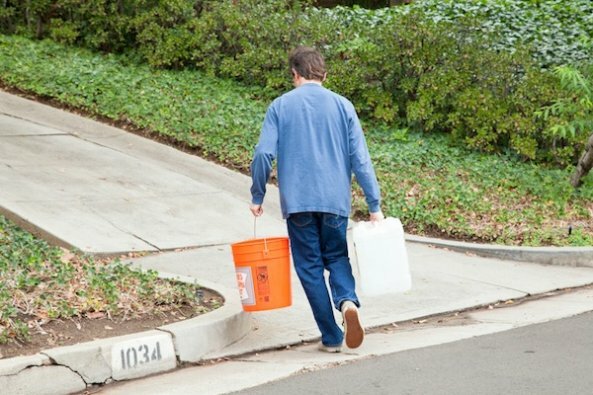 South Pasadena upped the city’s water restrictions to the “stage two” level, mandating that residents water their lawns just twice a week and fill their ornamental ponds only to levels required to “sustain” aquatic life. So when district officials learned that the high school pool would have to be drained for repairs, they figured, why not see if anyone wants to use the water before sending it to the storm drain? 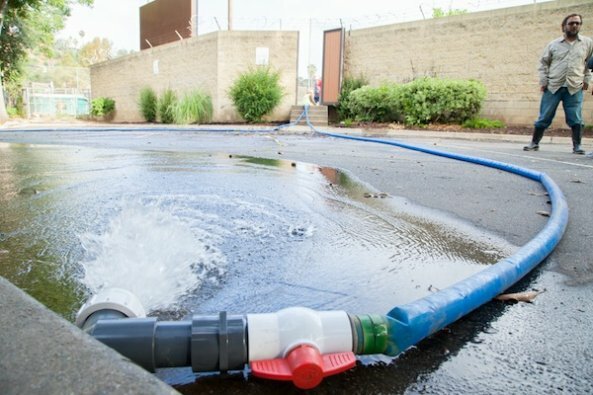 Just before 8 a.m., when the public was invited to show up, a pump had already started sending water out through a long hose into the parking lot. As the jackhammers ripped into the concrete and the repairs on the pool got underway, a neighbor who lived next to the school noticed the stream of water going by his property. He asked Steve, the pool manager, if he could use some of that water running down the street. Steve told him he could just spray it directly, so the neighbor picked up the hose and gave a hedge and some groundcover a drink. A couple that lives a few blocks away, Tom and Michelle, showed up with a few Home Depot buckets, a white jug, and a big trash can. Steve only filled up the trash barrel halfway because it was getting too heavy and seemed like it might break. The couple drove home very slowly to keep all the water from sloshing out. Michelle scooped out a few bowlfuls onto her pansies, and vowed to save the rest for a hotter, drier period. A father and son came with a couple of handle jugs like you find sitting on top of an office water dispenser. A neighbor from across the street came with a trash can— though it ended up leaking so badly he had to transfer the water into another bucket when he got home. Steve, the pool manager, was a little disappointed. 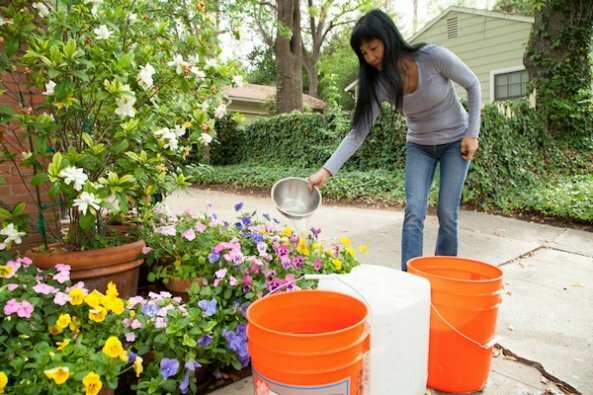 He said he had been a pretty vigilant water conservationist at his own house: He put plastic trash barrels by his gutters and used the collected rainwater on his plants. 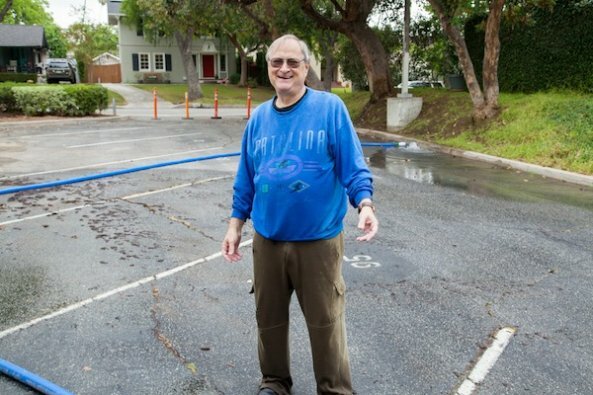 Steve didn’t have a choice about draining the pool and “I can’t take all the water myself,” he told Zócalo’s photographer Jake Fabricius. He watched it flow into the street unused.